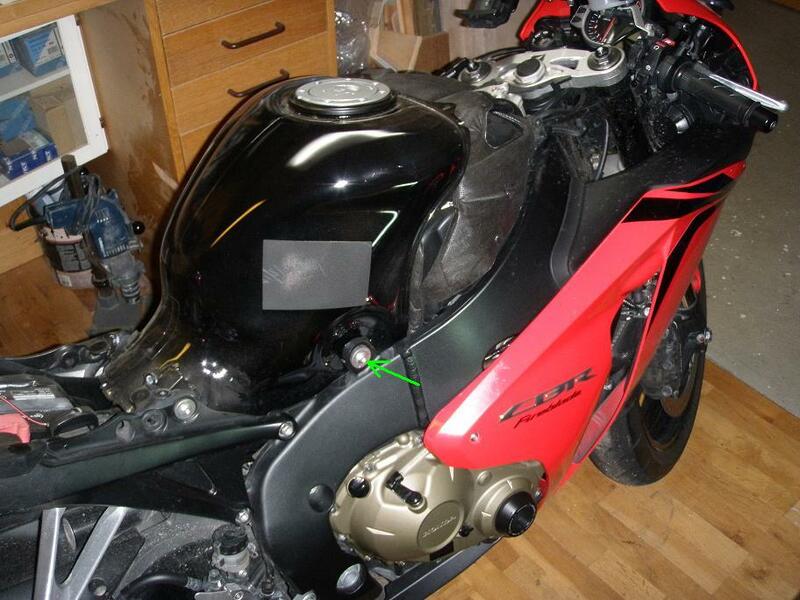 This Do It Yourself (DIY) article describes how to lift the tank on a 2008 CBR1000RR Honda Fireblade motorcycle. 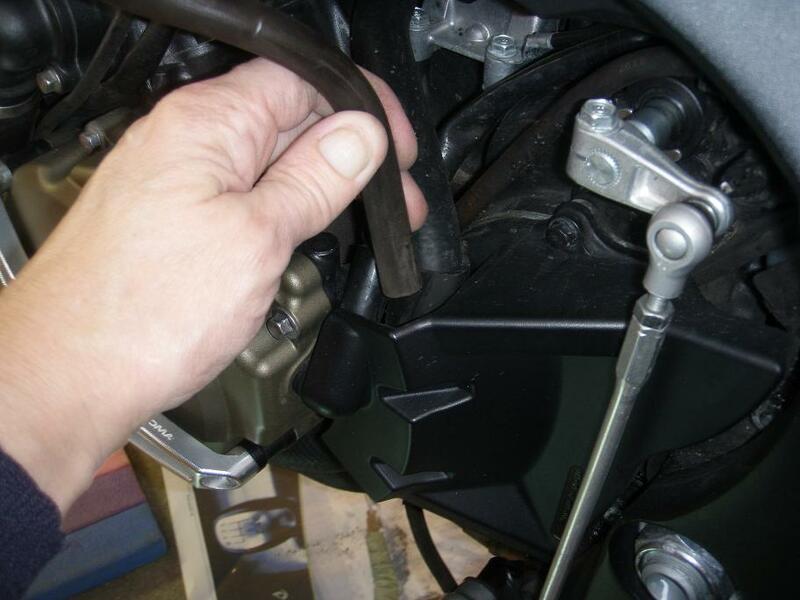 Most of the pictures in this article were taken while I was doing valve clearance inspection, so cowls and radiator have also been stripped off the bike. 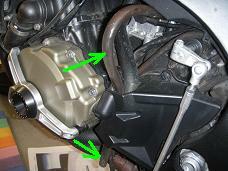 If you are only going to work on the top of the engine, you do not need to strip theese parts off. If you intend to remove the valve cover, you will have to remove them, as you will need sufficient space to get the valve cover out. This is an easy DIY task which. A first timer may spend 1 hour on it, an experienced may do it in 15 minutes. 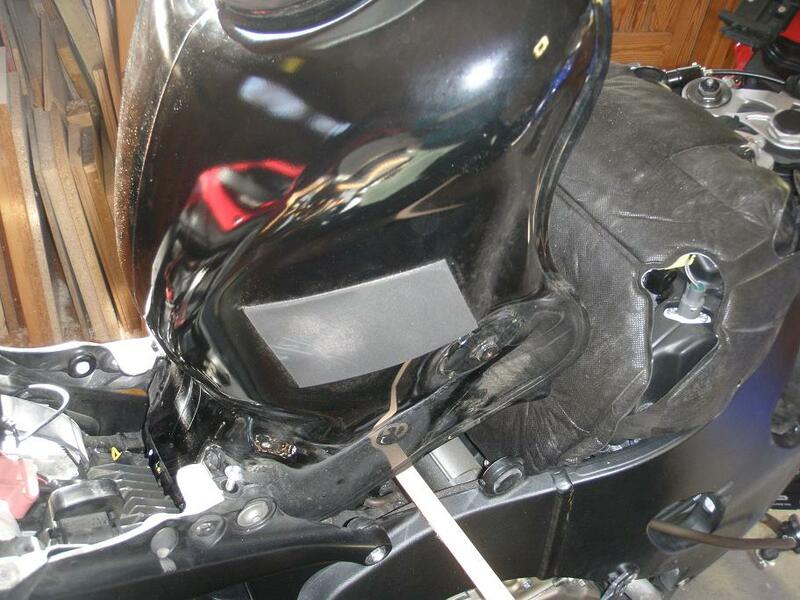 1 Place the bike in upright position so you have easy access to both sides. 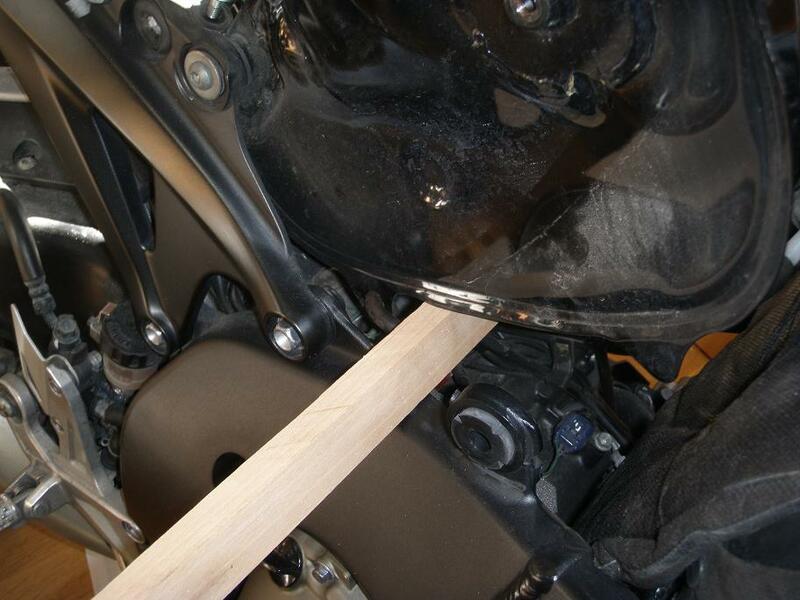 You may do the job using the side stand only, but upright is easier. 3 Remove the Top Shelter. 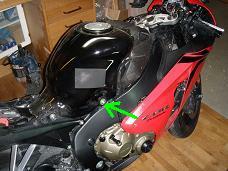 Remove the fuel tank mounting bolt and collar on both sides of the tank (right side bolt is shown below left). Release the fuel tank draining hose by pulling it upwards (as shown below middle and right) to ensure it can move freely when the tank is lifted. Slowly lift the front of the fuel tank upwards while making sure no hoses nor wires are streatched in any way. When the tank is lifted high enough, insert a support, e.g. a wood stick measuring aproximately 40 x 2 x 2 cm, as shown below middle. The Honda Shop Manual suggest to support the tank by first disconnecting the breather hose (marked with a green arrow on the large image below middle) and then insert a long thin steel rod through the breather hose hole on the right side, to the similar hole in the left side. Unfortunately I forgot to take a close up picture of how this, but it will be obvious when you get to it. Installation procedure is same as removal procedure in reversed order with exceptions as described in the referenced DIY articles and here below. 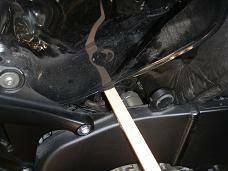 5.1 Lowering the fuel tank slowly while making sure no hoses or harness parts are stressed, kinked or bent. Also guide the drain hose properly into it's correct position. 5.2 Install the collars and fuel tank mounting bolts. Torque: 10 Nm (1.0 kgfm, 7 lbfft). 6 Remount the Top Shelter. 8 Remount Seat and Side Covers.